Nevada City was laid out as Vernon County's seat of government in 1855, and was named for a California town prominent during the Gold Rush. Founding spirit DeWitt C. Hunter had spent some years mining there before returning to western Missouri ("City" was dropped on incorporation in 1869). At the time of the 1860 census, Nevada City was a thriving hamlet of some 450 people. Three years later, war had cut the population at least by half, leaving mostly women, children and old men. County officials had fled south with the Confederate forces. The courthouse, a frame building on the southwest corner of the square, sat locked and deserted. The town had an early brush with war when General Sterling Price of the Missouri State Guard marched his 12,000 men north from his victory at Wilson's Creek toward Lexington, Mo. On September 2, 1861, Price's army confronted jayhawking Kansas forces over Big Drywood Creek south of Deerfield. For the following two years, though unoccupied, Nevada City lay more or less at the mercy of marauding Union and guerrilla [sic] forces. followed a small pro-Union militia party heading home to Cedar County, Mo., from Ft. Scott, Ks. The militiamen had stopped to rest in Nevada. Dashing in on horseback, the guerrillas [sic] scattered them and left two dead. When the survivors reached home, a cry for retaliation went up among the militia of Cedar and St. Clair counties. Two days later, Taberville's Capt. Anderson Morton led some 100 pro-Union Missouri State Militiamen over into Vernon, meaning to wipe out the Bushwhackers "and then march on to the 'Bushwhacker capital,' as they called Nevada City, and give it to the torch." The nickname was unjust. According to The History of Vernon County, Mo (1887), none of the Bushwhackers involved was a Nevadan. On the morning of May 26, 1863, Nevadans awoke to the sound of horsemen riding into town. At midmorning the soldiers separated into small squads and began knocking on doors. "We are going to burn this house," they told the residents, so said survivors. "Get your things out in twenty minutes. If you want any help, we will help you, but the house must be burned. This damned rebel den shall be destroyed." worldly possessions. 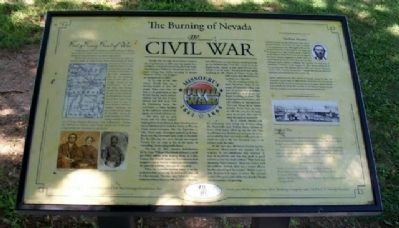 Until the end of the war Nevadans were to sit solitary amid the ashes. At the war's end, all Vernon County lay fire-blackened, blood-stained and desolate. Of the majority of ex-Confederates who returned "it may be truthfully said that they made as good citizens as they had made soldiers." With them and incoming Union veterans, "there was neither clash nor collision. Instead, there was a mutual alliance for the rebuilding of the county." Within a year or two, business had begun to revive. The railroads came in five years, and within two decades Nevada was prosperous and growing. In burning the town, the militiamen spared the homes of Thomas Austin and James Moore, who had cared for the bodies of the two dead militiamen and promised to return them to their homes. [Caption reads] Reconstructed southwest corner of Nevada square circa 1869 showing location of original courthouse. including his own family and his inlaws the Mayfields. 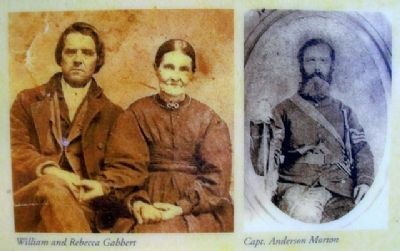 Among the family members were Eliza Gabbert and Ella Mayfield, two of Vernon County's adventurous "Lady Bushwhackers." Fearing they had been on a raid into Cedar County Morton ordered that none of them be left alive. Surrounding the Gabbert house in complete surprise the militiamen left seven bushwackers dead and burned the house. Old Man Gabbert escaped on an unsaddled and unbridled horse. Such was the neighbor-against-neighbor war of which the burning of Nevada was part - not the glamorous war of major battlefields and immortal warriors, but the gritty, sordid, suffering war of ordinary folk caught in a storm as inexplicable to them as a whirlwind. Nevada after the war where he practiced and continued his role in public life. Hunter performed one other service to Nevada during the war. As incumbent county clerk, in 1862 Hunter visited the area and spirited away the county records in a Confederate army wagon. 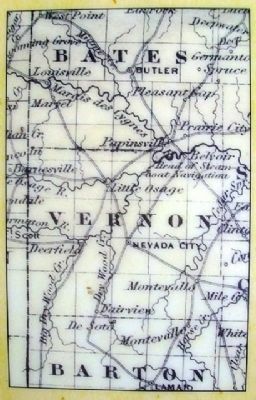 Vernon County is as a result one of the few counties on the Missouri-Kansas border that has property and probate records that precede the war. 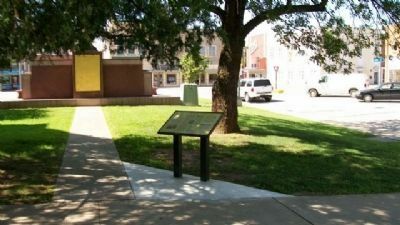 Erected 2009 by Missouri's Civil War Heritage Foundation, Inc., Metz Banking Company and I.M.P.A.C.T. Nevada Tourism. Marker series. 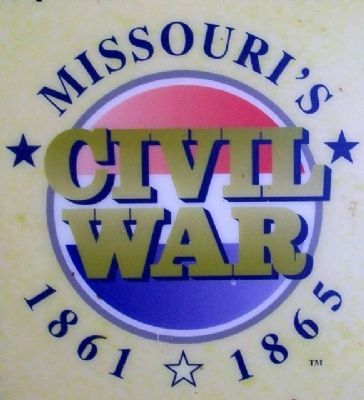 This marker is included in the Missouri’s Civil War marker series. Location. 37° 50.318′ N, 94° 21.458′ W. Marker is in Nevada, Missouri, in Vernon County. Marker is on Main Street near Cherry Street, on the right when traveling north. Touch for map. Marker is on the west grounds of the Vernon County Courthouse. Marker is in this post office area: Nevada MO 64772, United States of America. Touch for directions. of this marker); Vernon County Valor (about 400 feet away, measured in a direct line); Vernon County's Southern Heritage (about 400 feet away); Bushwhacker Museum (about 600 feet away); The Battle of Drywood (about 600 feet away). Touch for a list and map of all markers in Nevada. More. Search the internet for The Burning of Nevada. Credits. This page was last revised on June 16, 2016. This page originally submitted on August 8, 2010, by William Fischer, Jr. of Scranton, Pennsylvania. This page has been viewed 1,894 times since then and 17 times this year. Photos: 1, 2, 3, 4, 5, 6. submitted on August 11, 2010, by William Fischer, Jr. of Scranton, Pennsylvania.